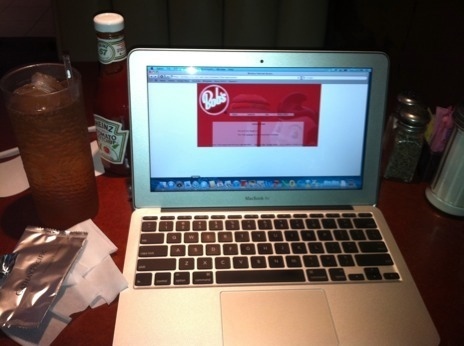 I was at Bob’s Big Boy in Pasadena for lunch which offered free WiFi making it a perfect opportunity to get some work done after I eat. I usually carry my MacBook Air 11″ with me almost everywhere I go so I can take advantage of the air conditioning and free refills on the ice tea on this hot summer day. 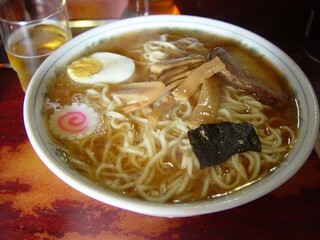 For those that haven’t figured it out yet, I’m Asian and ramen is a comfort food that I just can’t live without. I live about 8 miles away from a decent noodle house that isn’t ridiculously over priced, or a place that doesn’t serve low quality instant ramen that I can buy for 10 cents a pack. I usually like to go to the highly asian populated communities (Alhambra, San Gabriel, etc where I live in the LA Metro Area). The challenge is transporting the take out ramen from there to Pasadena when I’m driving myself without spilling a drop or getting my crotch burned so I had to use my noodle (pun intended) to find a way! One of my favorite workspaces is at Sizzler during the weekend. Unlike Starbucks, I get a big table, lots of space and decent food! I usually carry around my MacBook Air with a 3G USB Wireless card when I go there. Working out of Sizzler is MUCH more productive than out of any coffee house. Just for the hell of it, here’s my workspace at home. Posted it on Twitter too. I’ve changed the layout as this one seems more appropriate for now. It definitely has been a long day and I’m tired. Time for bed! I just slapped this all together in 30 minutes including the domain registration and putting a random Word Press template. Please bear with me as I will provide more details as this site continues to develop. Meanwhile, you can follow us on Twitter at #thegeeksoffice or simply coming here.